James Clayton McClain, Sr: James Clayton McClain, Sr., is my father-in-law. “Mac,” as he was dubbed in the military, is a mountain of a man. He was born in Fair Play South Carolina in 1915, making him 100 on June 6 2015. He’s 6’ 3” and has the arms of a professional football player. His family all share great genes. They all have thick blond hair, sky-blue eyes and live long healthy lives. His parents lived well into their 90’s. James Clayton McClain, Sr., is my father-in-law. “Mac,” as he was dubbed in the military, is a mountain of a man. He was born in Fair Play South Carolina in 1915, making him 100 on June 6 2015. He’s 6’ 3” and has the arms of a professional football player. His family all share great genes. They all have thick blond hair, sky-blue eyes and live long healthy lives. His parents lived well into their 90’s. One sister passed away a few years ago one week shy of 100. His goal is to be 100. He cares for himself and his log cabin in North Rabun County and each spring he plants a vegetable garden. He was the 12th of 19 children in his family. They were a poor farming family, though Mac says that everyone was hard working in those times and no one thought of themselves as “poor”. In their large family each child was destined to help with the chores. He learned farming and horse-back riding from his dad. He also became a farrier. And I learned early on – he is a horse whisperer. When he was 13 he ran away from home to be a trick rider in the 101st Wild West show, but returned home after only several weeks because he missed his mom’s cooking. On his way home from school one day he saw a pie plate laying in the yard and picked it up and gave it to his mother as he came inside. She said “Clayton, did you eat that entire pie I had cooling on the window sash.” He said “no Mom I didn’t, I found the plate in the yard.” Her mind made up, she spanked the young boy and sent him to his room without supper and proceeded to bake a new pie. She set it in the window to cool. Moments later, Eloise, their horse poked her nose through the window and ate the second pie too. Sarah Elizabeth wasted no time going upstairs to apologize to young Clayton. As a young man he held a number of odd-jobs. He worked in an ice house (we still have his old ice-tongs). For several years he drove gasoline trucks and delivered fuel to every gas station in the upstate of South Carolina, North Georgia and to Highlands and Cashiers, NC. The roads in the 20’s and 30’s were not what they are today, so he has many tales of fuel truck driving. He learned to fly from Jimmy Doolittle and worked as a crop duster. He even sold moonshine for a short time. When World War II broke out he enlisted in the Army Air Corps. While in training at Chanute Field in Illinois he was hitch-hiking and got a ride from Austin Wallack. In the back seat he met a pretty little gal named Alethea. They got married two weeks later. Almost immediately Mac shipped out for war. He wrote a letter to Alethea every single day, until his return. We still have the bundle of hand-written letters from all over the fighting fronts – some with lines blacked out or cut out by sensors for security reasons. After more training in snaky waters in India, the military sent him to North Africa driving fuel trucks for the Air Corps. On one trip they passed a trailer that appeared abandoned in the dessert, so they hitched it up and took it back to camp. It turned out to be General Erwin Rommel’s Command Post, so the U.S. Military gained some useful maps and insights. Mac earned some stripes. His detachment worked and lived in British camps and ate greasy mutton laced with a helping of desert sand. To this day he will not touch lamb. Fuel trucks, convoys and fuel dumps were prized targets of the German Luftwaffe. Mac says that whenever he heard or saw planes he jumped out the truck and ran for cover. One day he parked his truck and went into the mess tent to eat lunch. Four German fighters appeared and strafed the Allied Airfield. There was a nearby fiery explosion when they hit his fuel truck. As the war progressed they fought their way through Italy and into France, all the while he was keeping a watchful eye to the sky looking for German aircraft. He was shipped off to Great Britain in 1943. They were short of men for air crews so Mac was assigned to be a waist gunner in a B-25. On one mission over Germany the pilot and co-pilot were killed when their plane was hit by Flak. Mac still carries pieces of shrapnel in the side of his face and neck from that incident. Having flown crop dusters years before, he moved the dead pilot out of his seat and flew the bomber back to England. He saved the surviving crew from death or internment and received a scolding from his commander because he did not have the proper rank and training to pilot the plane. Fortunately, one of Mac’s buddies carried a camera with him so he has a large collection of vintage photos – including one with his buddies sitting on camels in front of the pyramids. After war in Germany ended Mac was sent to the Pacific. He experienced war atrocities there he still cannot talk about. In 1946 he returned to Kansas where Alethea was living with her Mother. In 1947 my wife Gayle was born and in 1949 James Clayton McClain, Jr, was born. When the Korean War broke out Mac re-enlisted in the new U.S. Air Force and got his stripes back. He stayed for a 40-year career and held a number of jobs as a mechanic and supervisor, rising to the rank of Chief Master Sergeant. But Mac’s first love was always farming and animals. When the Air Force transferred him to Northern California he bought 20 acres near Travis Air Force base and raised and boarded horses. At one time the herd was over 40 horses. As I indicated, horses – well, all animals – love Mac. Every animal I have ever seen goes straight to that man. His cows broke through a fence during a storm one night and wandered up the valley. The next morning Mac walked into the neighbor’s pasture and said “come on girls” and every cow got in line and followed him home. When I first met Mac he had a very large dog named Boots. Boots followed Mac everywhere and loved to sit next to him in his farm truck. She wore a big cowboy Stetson just like Mac. After a day’s errands he got a call from one of his buddies who said “hey, I saw you and Alethea driving in town earlier today I’m glad she’s feeling better.” Mac said – hey that wasn’t my wife, that was my dog! The man is blessed with great health and good looks. At 99 he is as handsome as he was when young. The sky blue eyes still twinkle when he laughs. Only recently is his thick blond hair starting to look grey. He lost his son 6 years ago and his Alethea 5 years ago. His longing saddens us, but he has the joy of 3 grand-children and 4 great grand-children. Four years ago Gayle planned what she dubbed as the Century Party. 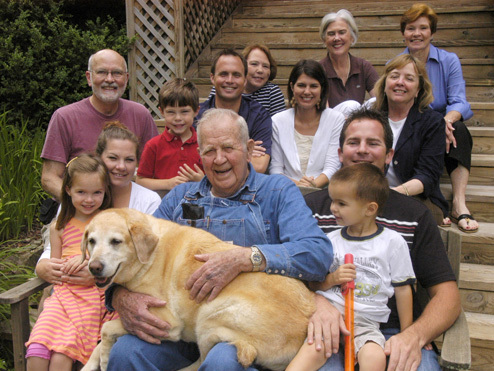 Mac turned 95 and on the same weekend his twin great grand-children turned 5. Mac took them fishing to Andy’s trout farm and then taught them to spit water melon seeds off his porch. We took the kids to Fromage for lunch the next day and their plates were garnished with water melon. Sorry about the seeds all over everything Jenny – blame Great Grand-Pa.
Gayle and I remain amazed and proud of her dad. He is a gentleman from another area; he keeps his word and expects you will as well; each bill gets paid the moment it arrives; he values his family and country above all else. We are very confident that James Clayton McClain Sr., will attain his goal of 100.